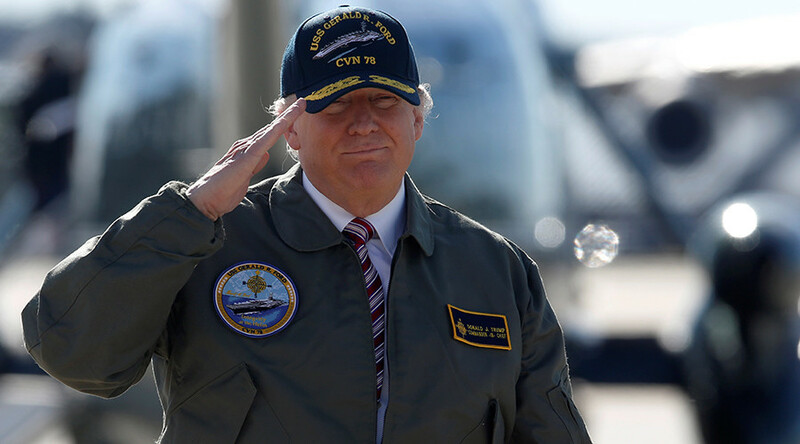 The US has “no choice” but to continue boosting its military power, Donald Trump has said, after Washington’s war machine showcased its latest weapons over the past week and demonstrated its willingness to use them. Trump authorized the unilateral cruise missile strikes on Syria and followed up by dropping the “Mother of all Bombs” on Afghanistan. Trump’s statement came after the Pentagon expanded its global reach and showcased its use force in recent weeks. On April 7, in an unprecedented unilateral show of force, the US launched 59 Tomahawk cruise missiles from the Mediterranean Sea targeting the Syria's Shayrat Air Base. Trump ordered the strike in response to the chemical weapons attack in Khan Shaykhun on April 4, which Washington blamed on Damascus before any investigation into the incident has even been launched. The strike on Syria which happened without the approval of the UN Security Council has been widely deemed as an act of aggression, although Washington’s NATO allies chose to look the other way in this clear violation of the international law, while voicing their support. Trump also authorized the combat test of the so called 'mother of all bombs' in Afghanistan. The GBU-43/B Massive Ordnance Air Blast Bomb (MOAB) was unleashed in battle for the first time on Thursday. The 21,000-pound (9,525 kg) bomb was dropped on a tunnel complex in the Achin district of the Nangarhar province in eastern Afghanistan near the Pakistani border. The area is said to be used by militants of Islamic State (IS, formerly ISIS/ISIL) affiliates, over 90 of whom were reported to have been killed in the colossal blast. Furthermore, Washington this month ordered a carrier-led strike group to provide a physical presence near the Korean Peninsula after Trump vowed to “take care” of the North Korean nuclear problem. In addition a fleet of F-35 stealth fighter jets arrived in Europe for the first time over the weekend as part of a planned NATO exercise aimed at “deterring” Russia. In an address in Tampa, Florida, prior to submitting the new budget proposal, Trump promised the US Central Command new weapons for the US military.